Republican candidates loyal to Trump have spent months campaigning for the vote of Puerto Ricans in Florida - who traditionally favor Democrats. Now they find themselves distancing themselves from the president. President Donald Trump's claim that his administration’s response to the devastation in Puerto Rico last year was an “unsung success” could be a gift to Democrats in Florida. 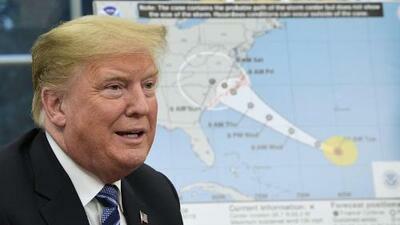 Trump’s controversial tweet comes after Florida Republicans have spent months courting Puerto Rican voters, who traditionally favor Democrats, ahead of the 2018 midterm election. As many as 250,000 Puerto Ricans are believed to have left the island in the wake of Maria, many resettling in the Orlando area of central Florida. However, it is unclear how many have since registered to vote in Florida, or have returned to the island. Republican gubernatorial candidate Ron DeSantis and U.S. Senate candidate Gov. Rick Scott have campaigned heavily for their vote as well as making several visits to the U.S. territory to view the destruction and recovery efforts. Both are in tight races with Democrats who are hoping the Puerto Rican vote could help swing the state in their favor. Republicans have controlled all statewide public offices for the last two decades. Trump's tweets bristled over criticism of the response to Hurricane Maria, in which 3,000 people died in Puerto Rico. “We got A Pluses for our recent hurricane work in Texas and Florida (and did an unappreciated great job in Puerto Rico, even though an inaccessible island with very poor electricity and a totally incompetent Mayor of San Juan). We are ready for the big one that is coming!” Trump tweeted. The administration’s efforts in Puerto Rico received widespread criticism, but after visiting the island last September, Trump said that Puerto Ricans were fortunate that the storm did not yield a catastrophe akin to the from 64 to 2,975. The storm is also estimated to have caused $100 billion in damage. Democrats seized on Trump’s unkind words. Democratic Sen. Bob Menendez argued it wasn’t the hurricane that killed 3,000 people. "Your botched response did,” Menendez tweeted. (Information from the Associated Press was used in this report).